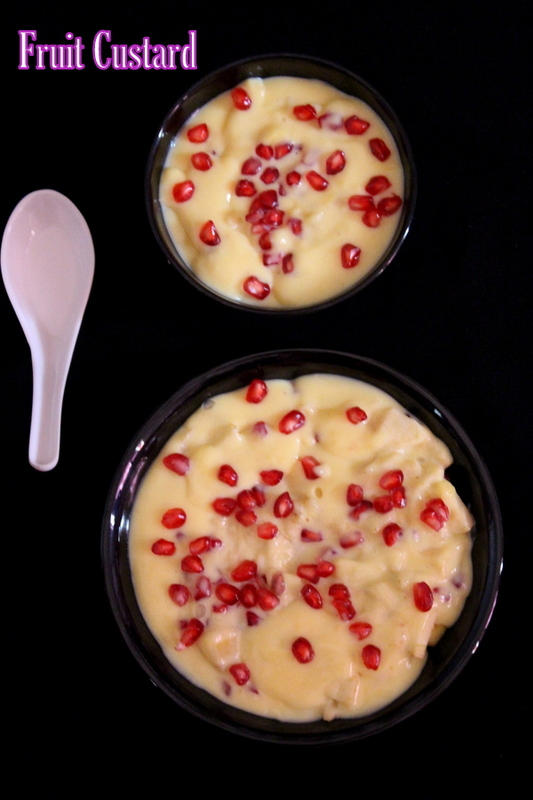 Fruit custard is a delicious chilled dessert made using custard and mixed fruits. This is a very special dessert commonly made in hyderabad. This recipe tastes good if there are no lumps formed in the custard. In my video recipe I have shown the correct way of making custard without lumps in the custard. This is the most simplest dessert recipe made if there is custard powder and milk available at home and favorite fruits can be added into it. First I shall show the procedure for making custard with milk then we need to add some chopped fruits. 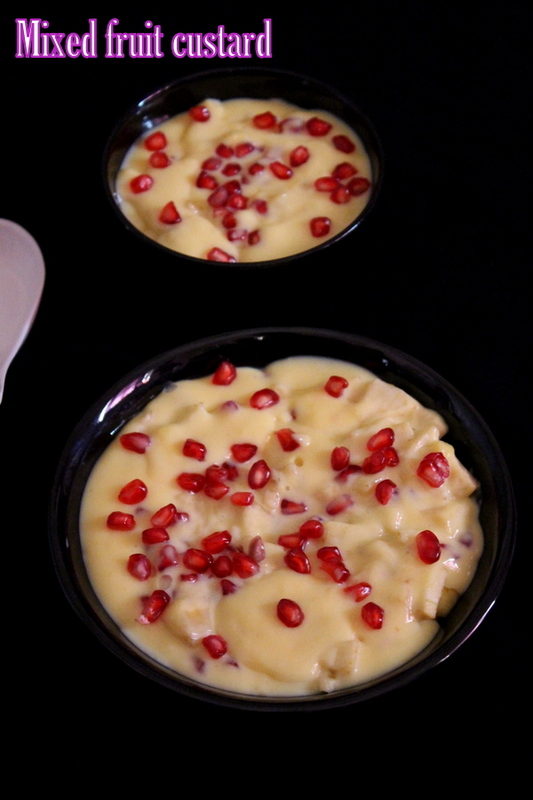 The custard needs to be chilled in refrigerator and while serving, fruits should be finely chopped or sliced and then added to the chilled custard. If fruits are added into the custard and stored for more than a day then, some fruits tend to leave water and spoil the whole dessert. 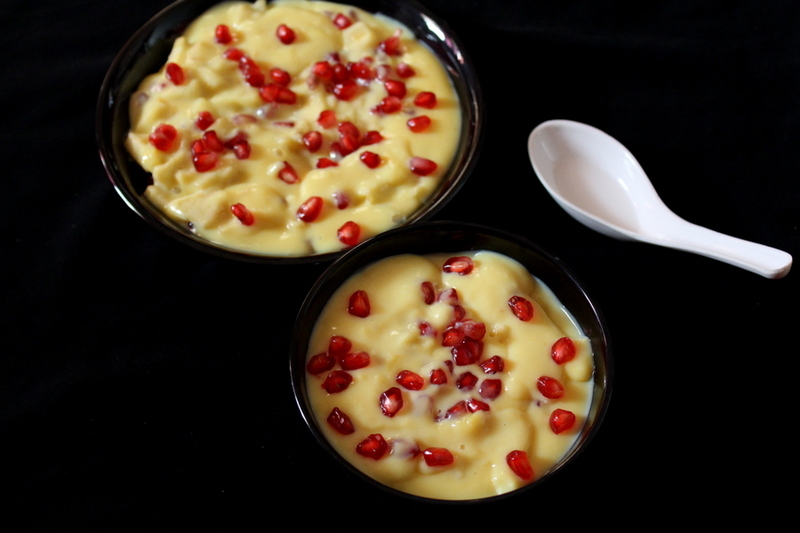 A hyderabadi special fruit custard recipe made by using custard powder paste mixed in boiled milk and by adding some chopped seasonal fruits. Firstly, in a sauce pan, add milk and bring it to a boil. Keep stirring for few minutes on medium flame. Add sugar and keep stirring for few minutes. Add milkmaid and stir well. In a small bowl, add custard powder and add milk, mix the powder and milk well like a paste/batter until no lumps are formed. Gradually keep stirring the milk and add the custard paste while stirring. Keep stirring for few seconds. Boil the custard for about 2 minutes. Chill the custard in refrigerator for few hours. Add any seasonal favorite chopped fruits in a dessert bowl. Add chilled custard all over the fruits. Garnish with pomegranate seeds and enjoy!!! 1.Custard powder is easily available in supermarkets/grocery stores. 2.Always low down the flame while adding custard paste and keep stirring while adding the custard paste in order to avoid lumps. 3.Always add chopped fruits while serving the dessert. 4.Finely sliced/chopped dry fruits too can be added while serving. 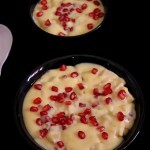 5.Store the custard in refrigerator and chilli it and add fruits while serving it.